It is often said that the last thing we should do is fussing over details while ignoring the broader picture, which is more commonly expressed as failing to see the forest for the trees, or ki-wo-mite-mori-wo-mizu, in Japanese. Today I really got the image and meaning of FORM 1065 and Schedule K, K-1, which are the forms to be used in filing tax return of a partnership and its partners. I must have gone over this topic again and again so far. However, struggling to understand & memorize the details had long been hindering me from getting the whole picture of the taxation scheme for Partnership until today. Now my understanding is quite simple. Form 1065 is used to net the income and the deductions in order to “calculate” the Ordinary income (= Sales － CGS －General Expenses, including Guaranteed Payment). For the purpose of calculation, the word, “total” is used in Form 1065 (e.g. “total” income, and “total” deductions) to subtotal the income items and the deducting items. Note that the Ordinary income that is calculated here is only a part of the items that are later passed through to partners. 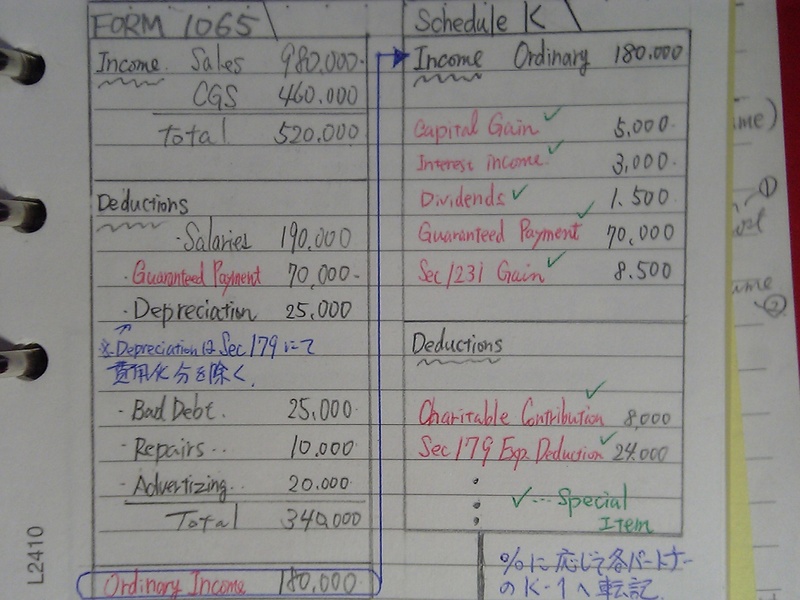 Schedule-K is then used to “list” up all the items to be passed through to the partners, including the ordinary income computed in Form 1065. 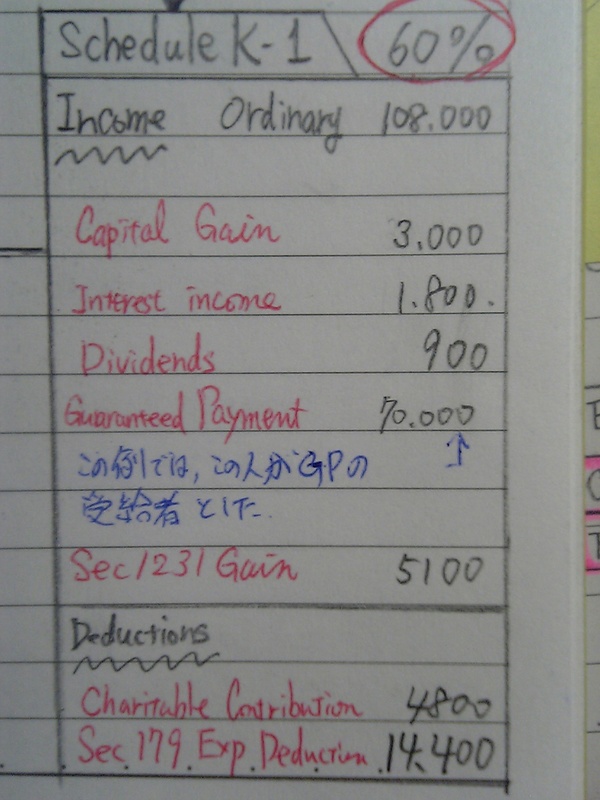 Besides the ordinary income, many other items called “special items” are enlisted on Schedule-K, including Capital Gain (Loss), Interest income, Dividends, Guaranteed Payments (← this time as an income element), Sec.1231 gain, and so on. These items (Ordinary Income and Special Items) enlisted on Schedule-K are enlisted just for full listing. They are not here to be further added up or netted with each other. Thus, you cannot find the word “total” on the Schedule-K.
Then, why are they listed up in such a way? It is because each of the items is passed through to Schedule K-1 of each partner according to the partner’s Profit & Loss share. Note that Ordinary Income and Special Items are passed through to Schedule K-1 based on the Profit & Loss share (e.g. 60%). And also note that Guaranteed payment is not passed through according to this proportion. In the illustrated example, the Guranteed payment on the Schedule K is $70,000, the total of which is passed through to Schedule K-1. This is because Guaranteed payment is a sort of compensation for the service-providing partners and so the absolute amount is “guaranteed” for the service-providing partners, which won’t vary according to the earnings or the partnership nor the Profit & Loss proportion among partners. This is how the items earned by a partnership get passed through to each partner’s Schedule K-1. Each item on the Schedule K-1 is finally included in the computation in Form 1040 or Schedule A, D, E, etc. of each partner.